Unfortunately this item is sold out for the Fall 2018 season. Shells of ice filled with light, ice lanterns have been created for centuries around the world. Sometimes called "ice candles," these glass-like luminaries reveal the simple wonder of nature. The Wintercraft System has been perfected through more than 30 years of field-testing. Easy to create, each ice lantern is uniquely beautiful. Young and old, artist or scientist, you and your neighbors will love Wintercraft Globe Ice Lanterns. 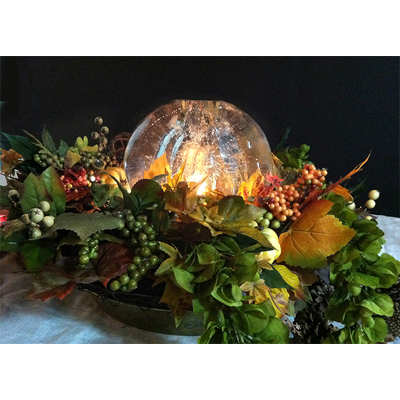 Globe Ice Lanterns can last up to 10 hours indoors and throughout the winter outdoors, depending on conditions. Note: Wintercraft balloons are very strong. Only under very rare circumstances would one burst when making a globe to fit on the Wintercraft Large Freezing Base. In general, the balloon should be filled until it rests comfortably on the freezing base (it should not wobble or roll off). For a small base a balloon should be filled to about 8-10" in diameter or about 10-14 lbs of water.